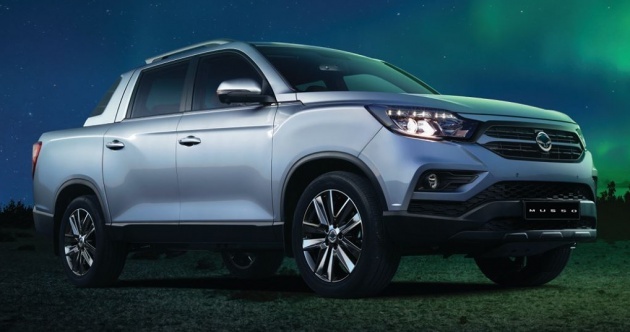 For years, SUV specialist SsangYong’s only pick-up model was the midsize Actyon Sports, but now there’s a larger, more sophisticated offering in the form of the Rexton Sports, which will also be called the Musso in certain markets. The company has released the first image and video ahead of the truck’s full unveiling at the Geneva Motor Show in March. As expected, the Sports is a close cousin of the standard Rexton, with everything forward of the B-pillar being practically identical to the SUV. Behind that, it’s the usual pick-up fare, although the bed appears to be quite a bit shorter than one would expect in the segment. Like the Rexton SUV, the Sports is only available with a 2.2 litre turbodiesel that develops 187 PS and 420 Nm of torque. Here, it’s paired to a six-speed manual or an Aisin-sourced six-speed automatic transmission (rather than the SUV’s seven-speed unit from Mercedes-Benz) and either rear-wheel drive or a 4Tronic four-wheel drive system. There’s also a body-on-frame construction that is typical of a pick-up. There are four trim levels that will be offered, with the 2,350,000 won (RM88,700) entry-level Wild coming with heated and power-folding side mirrors, 17-inch alloy wheels, LED daytime running lights, cruise control, Bluetooth connectivity and six speakers. The automatic gearbox is optional here. The 2,600,000 won (RM98,000) Adventure model throws in the slushbox as standard as well as 18-inch wheels, projector headlights, LED positioning lights and indicators, extra leather trim, a heated steering wheel, an auto-dimming rear-view mirror and keyless entry. Paying up for the 2,750,000 won (RM103,800) Prestige model gets you a seven-inch TFT LCD multi-info display, automatic headlights, dual-zone climate control, heated seats, a power-adjustable driver’s seat and speed-sensitive power steering. Lastly, the range-topping 3,060,000 won (RM115,500) throws in xenon headlights, 20-inch alloys, ventilated and powered front seats, autonomous emergency braking and side and curtain airbags. Options include a 9.2 inch touchscreen infotainment system, a 3D surround view system and a driver assist package consisting of blind spot monitoring, lane keeping assist and rear cross traffic alert. bring in mesidis engined SsangYong Rexton..
ford ranger and isuzu Dmax or toyota hilux will sell better than ssangyong. I wonder how many dare to buy a SSangYong brand in M’sia given its History? Next Post: Harley-Davidson trademarks “Bronx” – new model?